I think a lot of teachers who aren't familiar with the concept believe that offering student choice is a recipe for disaster. It might seem like "lazy teaching." I would expect that teachers who subscribe to this idea would be less than impressed when they walk into my classroom on a typical day. They might see stations activities set up, with kids sitting in groups, and they are talking to each other, AND the teacher is just walking around chit-chatting with them! Or they may see all of the students sitting in a big circle having a heated discussion (albeit a civil one) without raising their hands, and all the teacher is doing is just fueling the fire by asking incendiary questions! Or even worse than all that (because at least there's the appearance of some sort of structure there), it might be a workshop day, where students are scattered all over the room (umm are those kids sitting on the floor?!) and some are whispering in groups while others are alone, some are plugged into their Chromebooks while others write feverishly on sticky notes, and then there are kids (7th graders!) who literally have crayons and are drawing pictures while reading a novel. And there's music playing (probably 80s cardio, classic rock, or Lindsey Stirling). And the teacher? She's sitting at a bar-height table with three kids, talking to them. On a typical day, you won't see me lecturing from a PowerPoint. Not anymore... those days are gone (or at least very rare). You won't see everyone doing exactly the same thing. My students used to do that, especially in my early years in the classroom, but to be honest it got really boring grading the exact same paper 170 times. You won't see rows of desks either. I got rid of those this year, and I'll never go back as long as I have a say in it. You won't see me doing binder checks. You won't see packets. You probably won't even see homework (unless it is reading or working on a long-term project). What is happening in this classroom? Where is the teaching? Where is the learning? One of the best methods to increase student engagement in the classroom is to give the students choice in their learning. 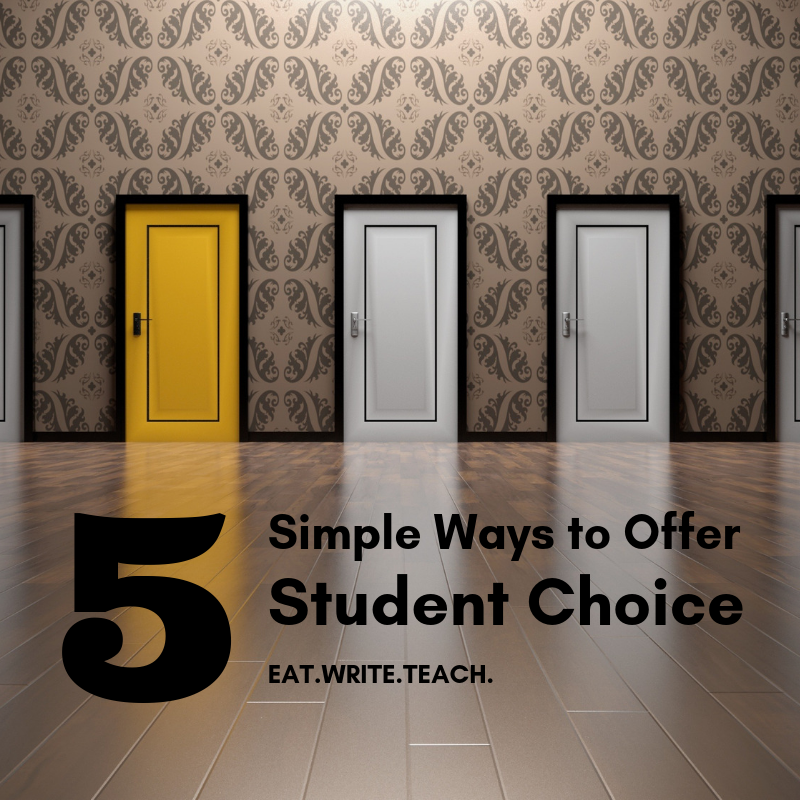 The simple act of allowing students to make choices about their learning can have a tremendous positive impact on engagement, behavior, and classroom culture. I have a student-centered teaching approach. I always have, though it hasn't always looked the way it does now. I will never forget how mortified my mentor teacher was during my student-teaching experience when I had students choose which character they liked best from A Midsummer Night's Dream for the purpose of character analysis. She couldn't believe I wouldn't have them all analyze the same character. I remember telling my sophomores they would get to choose an urban legend or conspiracy theory for their argumentative papers, and they would choose whether to prove or disprove it. Some of them were absolutely giddy with the freedom of choice, while others were at a total loss because they were so used to having limited decision-making in the classroom. There were a few students who were actually incredibly annoyed that I wouldn't just give them a topic to write about, because doing the early research and finding a topic that would actually meet the requirements of the paper was a lot of work on their part! When it was all said and done, though, every student analyzed a character from A Midsummer Night's Dream, and I would say almost every student turned in an argumentative essay that they actually enjoyed writing. Giving students agency in the classroom is so powerful, but it can be a daunting task. There are lots of "reasons" why a teacher might choose not to offer choices in their classroom. Doesn't that make your workload so much heavier? How do you objectively grade completely different work? There's no way my kids could handle that. They won't make good choices. You guys, I get it. I really do. I've said these things before myself! (I'm particularly guilty of that third one.) But offering choice in your classroom does not have to make you work harder. In fact, once you have shifted your mindset, I believe that student choice will lessen your workload. Alice Keeler often says, "Whoever is doing the work is doing the learning." Why are we killing ourselves doing all of the work for our students? They should be doing the work! You can objectively grade these assignments, and your kids can handle choice if you teach them how to make good choices. Allowing students the opportunity to make choices in the classroom transfers the workload and the responsibility, lessening the weight on our shoulders and putting more on theirs. This is a good thing. It is a good thing for selfish reasons (maybe we'll have a little more energy at the end of the day? ), but it is a better thing for these people in our classrooms who will be going into the real world one day and will have to make good choices without us there to catch them when they fall. Now, here's what I would never do. If you are ready to dip your toes into the water of student agency for the first time, I would never suggest that you start with choice seating. I would never suggest that you alter all of your assessments to be free choice. I would never suggest that you dive straight into a Genius Hour or 20% Time or Project-Based Learning format. I would never suggest you make enormous changes all at once, and I would definitely never suggest you model your classroom after someone else's. Much like we scaffold our students' learning, I think we must also scaffold student choice. We must progressively teach our students how to make good choices and learn in a more independent manner, and we must allow ourselves the grace to progressively let go of that death grip we are holding on our traditional classroom structures. Must your classroom look like mine? Absolutely not. Your classroom structure needs to suit you and your personality and your tastes, but it also needs to benefit your students. I think even the most traditional classroom can still give students agency. Are you ready to begin? Here are five simple ways to get started with student choice in the classroom. The easiest way to allow student choice is to simply allow them to choose their own topics. Are you teaching them how to write an argumentative essay? Choose an umbrella (ex: conspiracy theories, school rules, controversies, political platforms, etc.) and then let them choose from under the umbrella. Are the students studying medieval times (or any historical time period)? Let them choose to focus their studies on one element of the times (the food, the clothing, the religion, the government, etc.). Teach students how to choose a solid topics of study by showing them how to do early research, write focused research questions, and meet the requirements you have set forth. 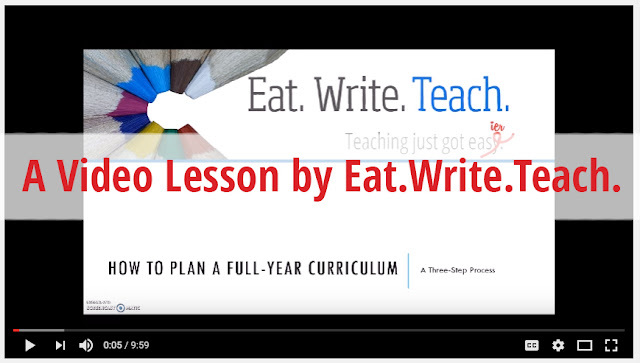 I think one of the best things we can teach our students (at any grade level and in any subject) is how to take notes. This is a life skill. Not all notes are created equal, and it is a powerful thing to arm our students with a variety of note-taking skills so they can choose the style that best suits their needs. I recently did note-taking stations with my students so they could try out five different types of note-taking methods. Earlier in the year, I modeled some note-taking methods. Instead of having students copy down every single thing you have written on the board exactly as you've written it, try allowing them some freedom in how they take notes. Let them do Sketchnotes, Cornell notes, webs, outline notes, scaffolded notes... Allow students to choose whatever style most suits them, as long as they get the needed information written down in a format that works best for them. I went on about this at length in my previous post, but an easy way to increase engagement in classroom discussion is to let the students lead the discussion. Start by asking them for their questions, but instead of answering them right away, record them on the board. After the first few brave souls ask a question, the others will get warmed up and you will soon have a really excellent list of things your students want to know! Once you've exhausted this activity, figure out which questions are mere comprehension questions and tackle those first. Let the students answer. Then use the rest to develop essential questions for whole-group discussion. Most of the time, this method will still allow you to get around to the questions you wanted to ask anyway, but the students are going to be more engaged because these are their questions, not yours. It's amazing what you can accomplish by simply letting students decide in what order they want to accomplish something. If there are several tasks that students need to complete, but it doesn't matter in what order they are completed, let the kids decide! My students love task list days. I just give them a list and say, "Hey guys. These are the things you will be working on the next two days. You can do these items in whatever order you like, as long as the entire list is complete by the end of the day tomorrow. Have at it." The students are all doing the same thing, but allowing them to choose the order in which they do it makes it go down better and you are teaching them about prioritizing tasks! If offering choices on topics worked really well, you can kick it up a notch by offering students choices in format. Obviously there is a time and place to teach a specific format (teaching MLA for an essay, for example), but there may be times where you could tell students "Okay, you may choose to write an essay, create a Google Slides presentation, or design an infographic." For example, last semester my students did a mini research project. They had to choose a product and learn how it came into existence (how it was made, who created it, etc.). Students selected a wide variety of topics, from fireworks to chocolate chip cookies to Snapchat. Students were tasked with informing others about their topic, and they were allowed to choose the format. Many chose Google Slides, a few wrote essays, and a couple made web pages. You may be wondering about grading this project when there were so many formats. The fact is, I didn't actually care which format they used. I wasn't grading the format. I was assessing them on research and informative writing standards. I was looking for things like clear introduction of topic, organization of ideas, the use of facts from various sources, and their ability to follow the research process. They could do all of these things no matter what format they used. In fact, our state standards require that students use a variety of formats in their writing, so if I only assign essays, I'm actually not meeting all of the standards. Pin the infographic for quick reference! In what ways do you allow students to have agency in your classroom? Is there some small change you could make that could have a major impact?